As you will know if you have visited the library or attended any events at the library, they don’t do anything by half measures. So, of course there was an amazing event to accompany the launch of their new Spring Programme where guest speakers got in front of a large handful of people to support the library and speak of the new art exhibition Launch that, if it had a name, would be called Affinity. So, what to expect from my first blog post of 2019? Well I’ll tell you all about launch night of course but I’d like to draw specific attention to events that should not be missed! There are plenty of events that will fit multiple curiosities and interests but if you can’t make it along, know that the library has an amazing array of books and archives that you could get lost in (I myself recently spent two hours going through archives from the Women’s Liberation Movement of the 1970s and I can tell you, it wasn’t nearly long enough!!). In fact, if I was to describe the library in a few words I’d say that it’s one of Glasgow’s most essential spaces. Maybe my Gender Studies student bias is showing itself but you don’t need to be a student of feminism to be absolutely blown away by the events that are put on by the library. If you have an interest in feminist history, women’s literature and art, ecofeminism and Nan Shepherd – yes you read that right, GWL is in collaboration with The Living Mountain’s author and I am living for this! – then you will have plenty to feast upon within their Spring programme. So anyway… first, let me talk about launch night. This wasn’t just the opportunity for library goers to pick up a copy of the new Spring programme. It was also the chance for everyone to see the new art exhibition by Ruth Barker and Hannah Leighton-Boyce. To top it all off, the launch of the exhibition saw Jackie Kay read poetry she had written for the exhibition entitled Affinity I, II & III. You can pop along to the library and see this stunning collection for yourself, and if you’re lucky enough, pick up a brochure of the collection that has Jackie’s beautiful poetry collection inside. What will I be attending and hopefully writing about? First things first, because of my schedule last semester I wasn’t available to make it to Open Book – but that’s going to change. Open book is led by Marjorie Lotfi Gill and is held monthly, every Tuesday. The topics take different focuses every month ranging from new beginnings to language. I’m not much for creative writing myself but there is nothing I admire more. I’ve worked in bookshops since age 16 and I love nothing more than to see and hear people discussing their writing so this is a MUST for me. I’ll be on holiday during the first session (5thFeb) but hopefully I’ll be able to attend March 5thand recurring sessions afterword. Thursday 7thMarch will also see the launch of Nadine Aisha Jassat’s poetry collection ‘Let Me Tell You This’. Again, if you’re interested in creative writing please come along to show your support of Nadine. Her collection will explore topics of racism, gender and bonds between women – it’s only fitting that an event as amazing as this is held at GWL! More story telling!! The library’s own Donna Moore will allow library goers to hear the “fictional tale of one of Glasgow’s first policewomen investigating dark deeds in Edwardian Glasgow”. Donna is a beacon full of crime fiction information and above all, talent. I think I might be most excited for this event! Literary fellows, please join me in celebrating Donna’s third novel on the 21stof March at 12:30pm. I realise I could talk about how amazing I know all the literary based events would be and you could have a full schedule based only on this, but GWL is also putting on an amazing collection of art projects, walking heritage tours, and screenings (which of course I will also be reviewing). But finally, I’d like to end this post with something that sits close to my heart – Women and the Environment. The library is also taking an active role in helping to change our world. You can see more about it in the programme itself. I myself am not sure which ones I will be able to make it to yet, but one thing’s certain. I’ll be attending all I can. Along with their ‘seeing things’ outings, you will have the chance to participate in the event ‘Our Space, Our Place: Creating Ecofeminism’ which allows women to explore Ecofeminism through talks, performances, and workshops. This gathering will include women academics, campaigners, writers and artists who will explore the connections between women and the environment and how we contribute to the changing world. This will be held on Saturday the 30thof March and will last most of the day (10am-4pm). I’m going to stop now before I repeat everything found within the programme – but please pick up a copy and give a copy to anyone you know in Glasgow who might be interested in attending events. I already can’t wait to return whether for an afternoon in the archives or for another amazing event! Thanks for reading, if you or anyone you know is involved in any events and would be willing to talk about it, please, don’t hesitate to get in touch. 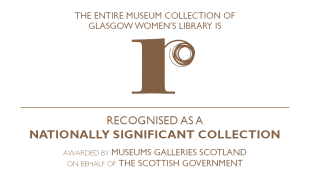 This entry was posted in Blog, Glasgow Women's Library Podcast and tagged with art, GWL spring programme, Jackie Kay, Spring Programme 2019.